Lynne Fruth, president of Fruth Pharmacy, presents a $20,000 donation to start the Bridge of Hope Fund. POINT PLEASANT, W.Va. — Sens. 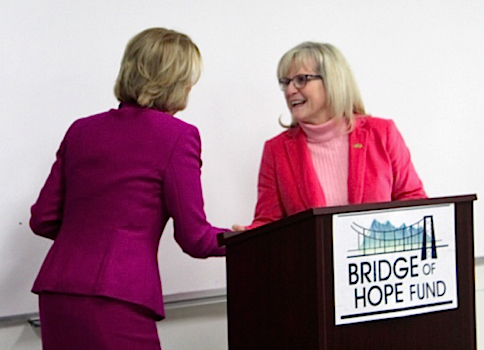 Joe Manchin (D.) and Shelley Moore Capito (R.) of West Virgina helped Lynne Fruth, president of Fruth Pharmacy, launch the Bridge of Hope Fund, aimed at fighting the drug abuse epidemic. The Bridge of Hope Fund will help people in sustained recovery from drug addiction with job training or help them earn a college degree. 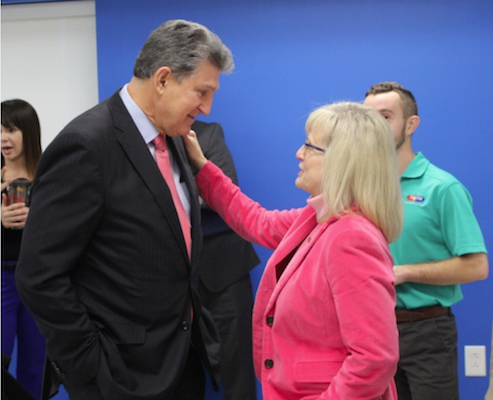 Fruth with Sen. Joe Manchin. The Greater Kanawha Valley Foundation will administer the fund and the application process. Participants can apply for scholarship help to access training in trades like carpentry, HVAC and welding or certification in such areas as cosmetology or massage therapy. Scholarships for community or technical college and university courses will also be available. “We have a huge problem to solve with the drug abuse crisis, and it will take all of us working together to make a difference,” Fruth said at the Bridge of Hope Fund launch event this month. Fruth Pharmacy committed $20,000 to start the fund and quickly gained additional support, bringing the starting amount up to $100,000. The regional drug chain said Walgreens and Cardinal Health have committed to a matching donation of $20,000 each to the fund, and the Cabell Huntington Hospital Foundation has also committed $20,000. “We’re at Ground Zero in West Virginia with the drug epidemic in our country,” explained Fruth, whose chain operates 30 locations in West Virginia, Ohio and Kentucky. “Fruth Pharmacy has worked with several facilities, provided scholarships and followed success stories of how people have been able to overcome their addictions and be restored to their families and a better life. Fruth with Sen. Shelley Moore Capito at the launch event. “The key to complete recovery is to bridge the gap of training and education needed for people to secure meaningful employment, feel better about themselves, and become an active and contributing member of our communities,” she added. Among its efforts to combat drug abuse, Fruth Pharmacy helped reduce methamphetamine production by removing single-ingredient pseudoephedrine products and replacing them with tamper-resistant products. The chain also has been active in Harm Reduction programs, supported syringe exchange with donations, and trained pharmacists in the dispensing and counseling for the sale of the opioid overdose antidote naloxone. Donations to the Bridge of Hope Fund can be made via The Greater Kanawha Valley Fund online. The application to apply for the Bridge of Hope scholarships is slated to become available on Fruth Pharmacy’s website and The Greater Kanawha Valley Fund’s website by late February.